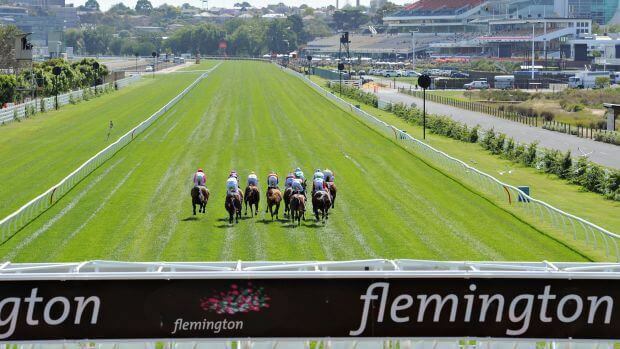 The Flemington straight has caused headaches in the past for a lot of punters but is there a good reason why? If you’re anything like me, you’re not a huge fan of the straight races at Flemington. I’m not entirely sure why, but there’s probably some fairly logical explanation about us overcomplicating them. I can’t read races down the straight and never seem to be able to pick winners. So I’m interested in looking at whether it’s actually harder to pick these races, or if it’s a figment of my imagination. How smart is the market? 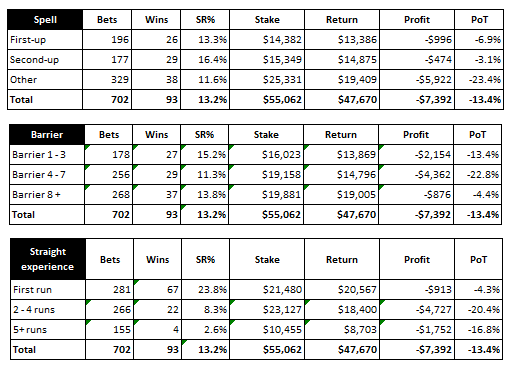 I figured I’d take a look at the market results for straight races versus all other races at Flemington. By doing this over a set period of time, you remove other factors from different tracks and conditions: I’m simply trying to look at whether the straight races result any differently to the other distances at Flemington. So I put together a basic, theoretical betting strategy to see the returns. There were 386 races at Flemington in total: 117 run down the straight (from the 1000m, 1100m and 1200m starts) and 269 at all other distances. Backing the top 6 in each race resulted in 325 wins in total, or a strike-rate of 14% on the 2,316 bets. Races down the straight were 93 winners from 702 bets for a strike-rate of 13.2%. All other distances were 232 winners from 1,614 bets, for a strike rate of 14.4%. Strike-rate is an overly simple measure and doesn’t factor in field size, but this does indicate that the market was less accurate when it came to straight races. In simple terms, more outsiders win down the straight than do over longer distances. So it’s not just me! A difference of 1.2% might not sound like much, but it’s fairly significant when your base in only 14.4%. Let’s now look at the associated PoT numbers for those bets. Obviously blanket backing of the top 6 chances in each race isn’t going to result in a profit, so it’s more a measure of how much we’re losing. All up, the 2,316 bets made a loss of $13,864 on an outlay of $182,357, for a PoT of -7.6%. Despite making up only 702 of the 2,316 total bets, the straight races accounted for more than half of the total loss: -$7,392 at -13.4% PoT. The longer races were -$6,472 at -5.1% PoT. So what does that tell us? The market finds it pretty hard to accurately gauge straight races, especially the fancied runners. In a way that’s good to know, as it’s not a figment of our imagination. It’s doesn’t help with picking a winner though! So I thought I’d also take a look at some stats for those 117 races down the straight. Horses at their first run down the straight are significantly better performed than those who’ve had 2 or more runs down the straight.